This review describes the Celestron Cometron 7x50s including my initial impressions along with examination during actual use for around 1 month. I live in a suburb in New England under Bortle 6-7 skies. I have 3 telescopes, the oldest of which I have had for one year. I had heard about observing with binoculars before but believed it was all just a strange fad, done by skilled observers at dark sites. When I was in the French countryside and looked at M31 with my family's cheap 8x26 binoculars I decided I had been completely wrong, and began doing some research. I found that most good beginners' 50mm binoculars fell in the price range around $100, which I didn't really want to spend. The reason for this price is the expensive BAK-4 prisms and supposedly better coatings than cheaper binoculars, which usually use BK-7 prisms. The vast majority of under-$100 binoculars, including the Cometrons, I heard, had collimation problems and light loss, due to the inferior build quality, prisms, and coatings. I know Celestron's customer support is usually quite good and I figured that they would ship me a replacement if my pair wasn't collimated, and I could always return them if they were still horrible. So I ordered them on Amazon and waited. I was rather impressed with the quality of the Cometrons given their price. The whole body is rubber armored, and there are only a few areas where water could seep in. Celestron markets these binoculars as "water-resistant" and I suppose they are. There are large indentations on each side of the binoculars for your fingers to grip. The center focusing knob is large and cylindrical, and has rubber notches that make it rather easy to adjust with gloves. The diopter adjustment has similar rubber notches and is very smooth to adjust. The binoculars come with a case, neck strap, and cleaning cloth. From information in other reviews and on the product pages I had no idea it came with any of these. The one complaint I have about these binoculars is the lens caps. While the eyepiece caps are hard plastic and grip the eye guards rather tightly, the front lens caps are bendable rubber which easily fall off. My fingers once accidentally touched the glass while I tried removing them from their case. The largest complaint of binocular observers about BK-7 prisms, from what I've heard, is that they cut off the exit pupil. While this is true with the Cometrons, the sides of the exit pupils are pinched by a small enough amount that it is rather difficult to notice. The Cometrons have a 6.8-degree field of view, which means that at 7x the apparent field is 45-47 degrees. Compared to my 55-degree Plossl eyepieces in my telescope this is a bit narrow, but it is fine for normal use. The field has next to no distortions except right along at the edge of the field stop, where it's hard to tell anyways. Chromatic aberration on the Moon is remarkably controlled as well. I have used the Cometrons several times, under both crystal clear and partly cloudy conditions. Keep in mind that the following observations were made at my home in a Bortle 6-7 zone. M31 is rather easy to find and is a clearly prominent fuzz with little to no detail. It is remarkably bright though. M42 appears similar to what it does in a small telescope, just a smaller. The wings are visible with averted vision, and the the whole region has a slight glow. The region around Cassiopeia and Auriga is beautiful, similar to diamonds strewn across black velvet. The Pleiades and Hyades are both simply stunning, showing many stars. The Moon shows remarkable detail, especially when seated in a chair. The Earth's reflected light on the unlit side of the Moon is extremely evident in the binoculars, unlike with a small telescope. The Celestron Cometron 7x50s are a fantastic bargain for the price and I would wholeheartedly recommend them to anyone interested in astronomy with a budget below $100. I am planning on supplementing them with better binoculars but I think that for the price you simply cannot get anything better. Even if you own a small telescope, I would still recommend these for quick peeks and wide-field views, and/or for travelling. If I do not bring a telescope to view the solar eclipse next year I will definitely purchase solar filters for these binoculars and bring them. For less than the price of a cheap Plossl it is difficult to not want a pair of these! Please note that I originally wrote this in November. Thank you for your review. Have you measured its aperture? I must say this Is accurate, because I own these binos. An excellent review, with which I agree wholeheartedly. I've really put these binos through the ringer over the past year. I paid $28.95, including shipping. I earned the AL's Binocular Messier certificate, and just a few days ago completed the Binocular Double Star program. 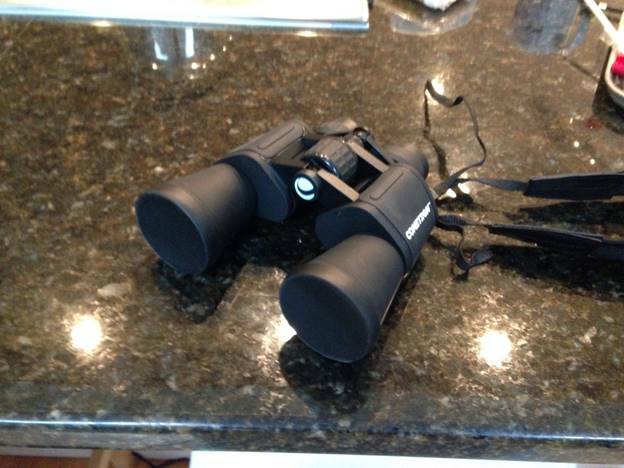 I used only these binoculars, no mounts, though I would occasionally prop my elbows on a railing or back of a chair. The views are just as good as you describe. I've even seen a touch of green color in M42 (I guess my location is 4/5 on the Bortle scale). I've also seen Neptune, Uranus, Vesta, the Gallilean moons, and of course a host of lunar features. A clever design feature, perhaps compensating a bit for the BK7 prisms, is a wider than usual exit pupil. Perhaps this is better for younger eyes, but I'm 54 and it does the trick for me. This was my introduction to astronomy by the way. Don't have a scope yet, but when I do get one, I'll always have my Cometrons nearby. I can't imagine observing without them. Thanks, Zane, for the good review. I am looking for an entry-level bino that does not disappoint without spending a ton of cash. The Cometron fits the bill. Thanks also to the other who chimed-in with their comments - also very helpful. I've now had these binos for a year and a half. I don't use them as much anymore now that I have a much higher quality pair of Bushnell 10x50s, but these still get a fair amount of use for travel and things. I'll be bringing them to watch the Falcon Heavy launch next week. I own a pair of these; I also own a pair of Nikon Aculon 7x50s. I picked up the Celestrons after owning the Nikons because I host community events and wanted an extra pair to hand to other people's kids. I also wanted to know what to recommend for beginners. If $100 will break the bank, then by all means get the Celstrons—as per your review, they're certainly worth what you get for $30. The build quality is good (nothing rattles, and collimation is tight across the range), and the image sharpness is fairly crisp at the center of the FOV. However, they suffer from significant vignetting, and the image quality suffers considerably along the edges (with only the center 1/3 circle being crispy, and the outer edge being downright blurry). In comparison, the Aculons are slightly brighter (if at all), but the image is sharp and consistent across the entire field. (Nikon claims they use aspherical lenses to achieve edge sharpness, so that's what the extra $70 buys you vice the BaK4 prisms IMO.) The Aculons are more forgiving on where I place my eyeballs (whereas I have to fiddle with the Celestrons to optimize the placement of the exit pupils). The Aculons are longer and a bit heavier (900g vice 765g for the Celestrons). The Nikon case is padded. And the Aculons come with dust plugs (vice caps) that don't fall off the objectives. I spend most of my time using my Nikon Action Lookout II 10x50s, so I'm not all that vested in which of the 7x50s is better. If I only had $30 to spend, the Celestrons are the only choice. But if I only had $100 to spend, what I bought would depend on how I planned to use them. If I were buying for a Cub Scout troop, I'd buy 3 pairs of Celestrons. If I were buying for myself, I'd get the Aculons. Sounds like you got a miscollimated pair. Thank you for the review, Zane. I just received mine. This is my first pair of bino -- if you exclude the cheap ones that everybody has been using once. I really like these bino. I find the image quality very good in the center, a bit less sharp on the edges. I didn't notice any significant amount of vignetting, as BQ Octantis said, but I'll take a closer look next time. In the end, and for my amateur usage, I think that's no big deal, since there's enough space in the middle of the view to enjoy a sharp image. I was very thrilled to see Jupiter's moons clearly from my balcony. I haven't tried them from a dark site yet, though. The build quality is good too, though I find the central area (don't know what it's actually called) a bit stiff (when you try to bring the 2 tubes closer). At least, it stays in place! The retractable rubber on the eyepieces is great if you have glasses like me, but is quite hard to put back in place (which is mandatory if you want to put the protecting caps back on the eyepieces). But once again, given the price (~40€ here in Germany), and for a beginner like me, I think that's a good investment! I always enjoy reading reviews of any 7x50 -- a most enjoyable size. I bought the Cometron a couple of months ago for my son, but I enjoy them as much as he does. I agree that they're outstanding for the price. If you want to delight in ultimate optics performance, there are of course better options. If you want a capable instrument for handheld astronomy tasks, the Cometron is probably the best bang-for-the-buck choice. I've compared it to my Celestron Skymaster DX 8x56. The DX does everything better, but the Cometron is right on its heels. For something like completing binocular observing programs, the Cometron should be all you'd need. do you know what is the difference between this Cometron and review's Cometron ?